After playing a large role in promoting activism and fundraising in the wake of the devastating earthquake in Haiti, various components of the social media community moved in different directions last week. For Twitter and YouTube, Haiti continued to be the dominant subject, though the focus of their attention shifted from encouraging activity to disseminating information. On blogs, Haiti still attracted attention, although several other stories received more notice. For the week of January 18-22, fully 58% of the news links on Twitter were about the tragedy in Haiti according to the New Media Index produced by the Pew Research Center’s Project for Excellence in Journalism. That was almost twice as many as the number of links relating to the next four largest Twitter subjects combined. Most of the Twitter activity involved users linking to mainstream news articles about the recovery effort. At the start of the week, religious and diplomatic questions drove that narrative. By late in the week, how cell phones and text messages were aiding the relief effort became the focus. Twitter users often link to technology-based stories; the connection of these gadgets and the quake’s aftermath seemed like a natural association. On YouTube, all five of the most-viewed news videos of the week consisted of raw footage of the destruction caused by the earthquake. Viewers were able to see the extent of the devastation on their own computer screens despite being many miles away from the actual event. 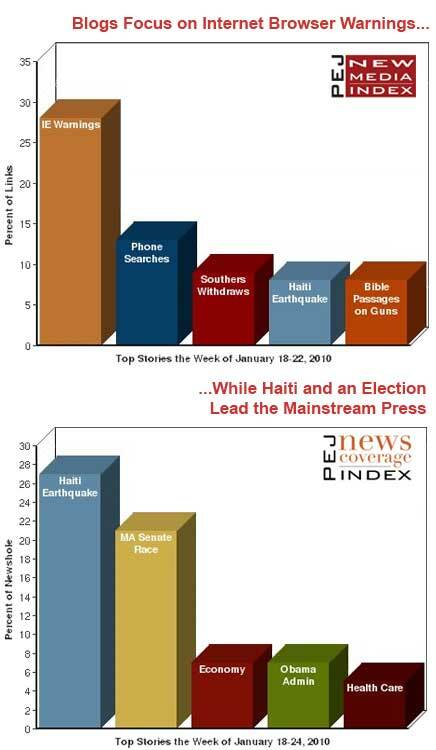 Among blogs, however, Haiti was the fourth-largest subject as measured by news links, receiving 8% of the weeks links (down from 43% the week before). A collection of very different subjects gained more interest on the blogosphere instead. The top subject on blogs, representing 28% of the links, was about warnings from both Germany and France about security risks posed by using early versions of Microsoft’s Internet Explorer program. Most bloggers expressed their dislike of Microsoft’s Web browsing program, especially version 6, and recommended that their readers switch to other software. The second-largest story (at 13%) was a Washington Post report that the FBI had illegally collected more than 2,000 telephone call records between 2002 and 2006 under the auspices of fighting terrorism. Third (at 9%) was the withdrawal of President Obama’s nominee, Erroll Southers, to lead the Transportation Security Administration. Fourth (at 8%) was the aftermath of the Haiti earthquake followed by a BBC report (also at 8%) about coded references to biblical passages which had been inscribed on guns used by American and British soldiers. 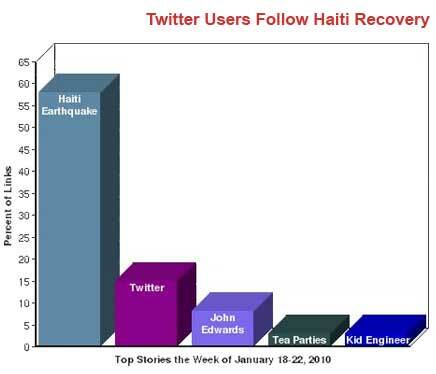 The other stories that gained traction on Twitter did not receive nearly as much attention as Haiti. Second, at 15%, were several stories about Twitter itself including the news that Microsoft chairman Bill Gates had begun his own Twitter account. The admission that former Senator and presidential candidate John Edwards had fathered a child with his mistress was third at 8%. A Fox News report about black conservatives who are playing a key role in the Tea Party political movement was fourth at 3%, while news that a 9-year-old from Macedonia named Marko Calasan had become the youngest ever Microsoft Certified Systems Engineer was fifth, also at 3%. As last week began, the suffering in Haiti was very much on the minds of many Twitterers. On Monday, a number linked to stories that detailed components of the relief effort. Some pointed to a CNN video and story about how the religious beliefs of many Haitians were not shaken as a result of the tragedy. Others focused on a column in the London Times by author Linda Polman who criticized media outlets for portraying Haiti as dangerous and full of lawlessness. This perception has slowed the relief effort, she claimed, because many relief workers were reluctant to go into poor neighborhoods without armed guards. On Tuesday, the story took a turn when the French minister in charge of humanitarian relief, Alain Joyandet, accused the United States of "occupying" Haiti rather than trying to aid victims. Many tweets linked to the story in Britain’s Telegraph about the accusation and expressed offense. "One can only stand back and gasp in awe at the profundity of French cynicism," wrote Phil Johnson. "The U.S can never do anything right in some eyes," added Carlos Palomino. By Thursday, the focus on Twitter shifted to stories about how technology factored into rescue efforts. There was a significant amount of attention paid to a Wired story about a man who used his iPhone to stay alive following the quake. Dan Woolley, an American filmmaker, was trapped under a pile of rubble when he used various applications on his iPhone to assist his survival. Among other things, the iPhone helped illuminate the area around him and gave him instructions on how to treat wounds. Woolley even set an alarm to go off every 20 minutes to prevent him from falling asleep in case he went into shock. "In a life threatening situation? There’s an app for that," remarked Mark Hepburn. The story was so popular that the morning of Thursday, January 21, more than 1,800 tweets included a link to the story, which was more than four times the amount of the next largest story at that time-the ongoing saga of John Edwards’ infidelity. The next day a similar theme drew interest with the appearance of another Wired article about relief workers using social networking to help their efforts and how some of the trapped victims were able to send distress calls via text messaging. "The crisis in Haiti is showing ‘new and unprecedented’ uses for social media in humanitarian response," commented the2noelle. "That’s RIGHT – Twitter saves lives," added Rocco X. For the bloggers that were discussing Haiti, two different stories drew their attention. One was a January 16 Washington Post report about financial concerns involving musician Wyclef Jean’s charitable foundation named Yele. Some organizations declared that the charity’s bookkeeping was inadequate and wondered if donations were going to the intended purposes. Bloggers varied as to how troubling the accusations were. "I honestly don’t know what the deal is with Mr. Jean’s charity and am not going to play a guessing game," decided Waxing UnLyrical. "I do think he is to be commended for springing into action so quickly after the earthquake hit and being a very public face for the poorest nation in the Americas." "No one questions Yele’s sincerity or that they have done good work in Haiti," wrote Citizen K. "The main issue is whether Yele is prepared to efficiently apply and distribute the contributions they’ve received in a timely manner. For donors and would-be donors, this is the key point." "Wyclef’s heart is in the right place and his leadership is sound he has a track record that includes humanitarian awards," supported Tru Speaks. "He was at ‘ground zero’ in Haiti as early as Anderson Cooper; he is a man making moves and helping Haiti. SUPPORT HIM!" The other story was a BBC report that the President of Senegal, Abdoulaye Wade, offered free land and repatriation to Haitian victims who were interesting in returning to "their origins" in Africa. Bloggers disagreed on the value of such an offer. "I was really moved to see an offer from Wade which no other country at the aid forefront would ever grant-resettlement," declared Rosebell’s Blog. "Even when there are still questions regarding what the Senegalese people think of the offer and whether the Haitians could be accepted by the locals, I find it worth a discussion." "Haitians do not need Senegalese land," decided Opalo’s Weblog. "Haitians need to get their act together in Haiti. He [Wade] is like the bleeding hearts who are willing to help strangers in foreign lands while their own relatives starve. Senegal has an income per capita of $1600. Life expectancy stands at 59 years…Mr. Wade’s nonsensical grandstanding is an embarrassment." The top news videos on YouTube were all about the aftermath of the Haiti earthquake and were similar both in form and in content. All five videos contained raw footage of the destruction and suffering that were caused by the tragedy. The top video was taken only hours after the earthquake occurred and came from the city of Les Cayes. It was shot by Louis St. Germain, a pastor who runs an orphanage there. It shows a large group of people walking through the rubble of a demolished building and gives a sense of the scope of the damage. YouTube allowed users to see the extent of the devastation for themselves. While many previous tragedies have been caught on video for the world to see, the on-demand nature of YouTube meant that viewers did not have to rely on television stations or news organizations to show them edited footage. Instead, users could choose to see lengthy, uncut images when they wanted to and even share them with others. Combined, the top five videos were viewed more than 5 million times. Bloggers spent more time focused on other stories beyond Haiti last week. In particular, technical warnings from several European governments drew the most interest. After Germany and France both issued warnings about possible cyber attacks on computers running Microsoft’s Internet Explorer [IE] and suggested that people switch to other software, bloggers added to the criticism by noting they have not liked Explorer for years. "It’s true that no browser is perfect and other browsers have potential problems that hackers could exploit. But right now, IE is simply not a safe browser to use. Firefox, Chrome, and Safari are much safer alternatives," advised Natalie at Netbook Boards. Some acknowledged that the current version 8 of Explorer was more effective at preventing attacks, but argued those using previous versions were taking significant risks. "Look, if you are still using IE6 you deserve every bad computer thing that happens to you," warned Doug’s Dynamic Drivel. "Get IE 8 if you must use IE (why that would be I don’t know) but really just get Opera or Firefocx, both of which are more secure than any version of IE, despite MS’ protestations to the contrary." "So if you are still using IE 6, then it is finally time time to get rid of that very old insecure browser," seconded Tomi Engdahl’s ePanorama blog. "Any IT professional who is still allowing IE6 to be used in a corporate setting is guilty of malpractice."